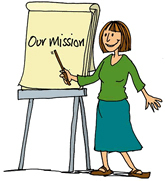 As a Service User led organisation we have a clear mission. To provide opportunities for Mental Health Service Users, past and present, to share their views and experiences about Mental Health issues including Mental Health policy, strategy, and service provision. With the groups' permission these views can be represented to others - for example, Mental Health commissioners, service providers - with the aim of improving the services available. We have a strong set of core values that inform all of the work that we do. The belief that all Service Users / Survivors have a right to be treated with dignity and respect. The belief that by working together we can create a culture of hope, support and recovery that embodies a belief in people's own ability to manage change and improve the quality of their lives. We also strive to create communities free from stigma and discrimination. How does SpeakUpCIC make links with other providers in our area, including statutory services? SpeakUpCIC staff and Service User representatives attend Local Forums, Local Mental Health Action Group (MHAG) meetings, County Wide MHAG Group Meetings, Council of East Kent Service User Forums, Patient Participation Group and Health Reference Group meetings with their local GP Clinical Commissioning Groups and other local meeting. We have face-to-face meetings, telephone, email, personal visits, group forums and a varied selection of speakers mostly representing other providers at the Forums; work with other agencies e.g. Health Promotion; NHS Health Trainers; Thanet College; Richmond Fellowship; MCCH; Mental Health Units; and local Resource Houses, feedback from Day Centers and suggestion boxes at the Day Centres and Community Mental Health Centres. How does SpeakUpCIC support people in accessing other relevant services? A regular newsletter for members and this fantastic new website are two key ways we provide information about our services and others including emergency numbers e.g. Samaritans; Mental Health Matters; single point of access number; crisis team; Additionally we often provide telephone support and signposting to many of you who don't know where to go with your query. Even if we can not help/support you directly we will always try to put you in touch with the relevant body for your needs. What type of services does SpeakUpCIC signpost people to? We tell people about the range of services available through Community Groups; Day Services; Advocacy; Back to Work projects; Probation; Housing; Training; Social Services; Duty Teams; Help-Lines; Support Groups; and others. How does SpeakUpCIC promote its services? How does SpeakUpCIC make use of Information Technology? This website is our latest information technology tool for Service Users across our region. It has a host of information about SpeakUpCIC, plus signposting to other organisations and resources that promote Mental Wellbeing and aid recovery from Mental Distress. Probably the most exciting innovation though is the introduction of our Facebook Page. People across our region can now get connected online and have their say about mental health services in a safe environment from the comfort of their home or office base. This is especially important for those Service Users who may be unable to physically attend one of our regular forum groups or activities. It means their voices can still be heard, their opinions asked for and included in feedback to service providers. And don't forget that forum members can visit the SpeakUpCIC office during office hours to access the Internet! How do we ensure fair representation at User Forums? We provide written terms of reference, eligibility, ground rules, monitoring of attendance by age, gender, and ethnicity. We take positive action to include under represented groups e.g. we set up a Lesbian, Gay, Bi-Sexual, Transgender and Questioning (LGBTQ)Forum; we recognise that people in the LGBTQ group have mental health needs too. We are in the process of setting up a young persons group and are investigating how we can reach out to asylum seekers. How do we ensure a fair and accessible service is delivered? We ensure a fair and accessible service is delivered through our Equal Opportunities Policy; monitoring of activities; user surveys; Suggestion Box; feedback from individuals and at group meetings; reaching out to established groups e.g. LGBTQ Group; Women's Groups & Men's Group. SpeakUpCIC has its own complaints procedure too. How do we evaluate SpeakUpCIC's activities to ensure they meet the needs of Service Users? We conduct regular satisfaction surveys to gain feedback on groups and other SpeakUpCIC activities Users are involved in this process and in the monitoring of complaints and their resolution. Apart from a questionnaire, what other forms of assessment for User satisfaction do we use? We have suggestion boxes in a number of local mental health venues. These are regularly monitored by SpeakUpCIC staff and the contents reviewed and acted upon. Feedback is sought by word of mouth, from SpeakUpCIC groups, commissioners, managers, other agencies, and from individuals including carers, relatives and friends of service users. If this all sounds like something you would like to become involved in and you'd like to have your say - why not join SpeakUpCIC? To champion the rights of service users. To encourage users to speak out for themselves. To seek to improve the quality of services available in the area. To encourage users to participate in the planning and delivery of local mental health services. To encourage statutory and voluntary bodies to recognise the need for meaningful involvement of Users and Survivors in all aspects of the planning and monitoring of mental health services. To put forward representatives to local and county planning meetings to express users views. To provide support to all members through sharing experiences in a relaxed and informal environment and peer support. To provide a safe opportunity for users to share experiences and to discuss issues of common concern either individually or in groups. To improve awareness amongst Users, Survivors, general public and mental health workers of the need for change in mental services and in attitudes towards those with mental health problems. To work to provide a culture of hope that embodies a belief in peoples own ability to manage and improve the quality of their lives. To network information to all members and to those unable to participate in the forum. To challenge and combat stigma and discrimination that those in mental distress are faced with. To support and develop self-advocacy. SpeakUpCIC became a Community Interest Company in February 2011. Community Interest Companies (CIC) are limited companies, with special additional features, created for the use of people who want to conduct a business or other activity for community benefit, and not purely for private advantage. This is achieved by a 'community interest test' and 'asset lock', which ensure that the CIC is established for community purposes and the assets and profits are dedicated to these purposes. For SpeakUpCIC our primary purpose (or social objective) is to carry out activities which support people suffering with mental health in the areas of Thanet, Sandwich, Deal, Dover and Ashford. We give a voice to Mental Health Service Users and represent their views at the highest level with the organsations that deliver the actual services. This means that our members have an opoortunity to shape and develop the help that is available to anyone living with mental ill health in our area. SpeakUpCIC evolved from an organisation called East Kent User Forum, which was established in 1992 and was supported by Kent County Council and Rethink Mental Illness. Striking out on our own and becoming independent means we will have the freedom and autonomy to develop and shape our workforce, services and projects to ensure we support and deliver much needed services that make a real difference to peoples well-being. SpeakUpCIC evolved from an organisation called East Kent User Forum, which was established in 1992. SpeakUpCIC groups are currently active in Thanet, Sandwich, Ashford, Dover & Deal. Funded by Kent County Council, The Big Lottory Fund, Cliftonville First and The Allen Lane Foundation the groups aim to promote the interests of Users and ex-Users / Survivors of mental health services. Run by our energetic and inspired Managing Director - Maggie Gallant who is supported by her small team of two staff and an army of volunteers SpeakUpCIC continues to be a dynamic and forward thinking project that has both grown, developed and evolved.